SAN FRANCISCO, Dec. 16, 2013 /PRNewswire/ — Moondrop Entertainment today released Drawp Unlimited for iPad. 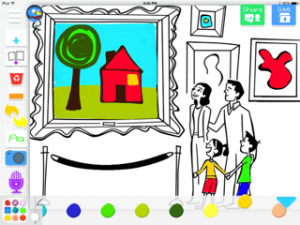 This imaginative drawing app lets children develop their creativity and connect to loved ones by creating original art and safely sharing it with family in a parent-approved network. Drawp is the first app to offer professional-grade art software, seamless safe sharing, and unlimited free cloud storage for archiving children’s artwork. With this release, Drawp is launching a collaboration with talented artists from around the world who will create coloring pages exclusively for the Drawp app. The objective is to provide children with a constant stream of high quality art and to expose them to different styles in order to stimulate their creativity. The first artist to be featured is Chuck Gonzalez who has illustrated for Scholastic, Chronicle Books, Nickelodeon, MTV, Tiger Beat and Babble Magazine. His new festive holiday canvases and drawing prompts will inspire and delight kids of all ages. Drawp uses professional-grade drawing software that is customized to be accessible and easy for children. Over 200 paint colors, including digital textures such as Furry Flurry and Mess Monsters, stimulate children’s interest and inspire them to create. Kids can draw on a blank canvas or coloring page, as well as add voice recordings and photos to enhance their drawings. With Drawp’s SimpleShare™ technology, users can simply swipe thumbnails of their mini-Picassos and share with up to 16 parent-approved contacts. Drawp delivers artwork via email or text, but children stay within the app, don’t need an email address, and aren’t exposed to the Internet. Recipients do not need Drawp or a mobile device to receive artwork, and contacts can instantly respond with written or audio notes. Sharing and communicating are important for kids, and Drawp keeps children connected with long-distance loved ones, grandparents, or parents at work. The Drawp app includes unlimited free storage for automatically archiving digital artwork in the Drawp cloud, so it doesn’t take up device storage. Drawp has received the TrustE Children’s Privacy Seal of Approval and strictly complies with COPPA (Children’s Online Privacy Act). Drawp Unlimited – Drawing Families Closer Together is available for iPad on the App store for $4.99 and provides unlimited access to Drawp’s hundreds of features with no in-app purchases. A lite version is available for free and allows users to purchase additional paints within the app for $1.99. Drawp requires iOS 6.0 or newer, and is iOS 7 compatible. Moondrop Entertainment was founded to provide outstanding educational tablet apps for children. The company’s first release, Drawp, connects children with loved ones through the simple acts of drawing and sharing. Moondrop’s mission is to combine technology and art to nurture creativity, build self-esteem and provide a platform for seamless collaboration. Read more news from Moondrop Entertainment.